What are your clients looking for when they come to your salon. Most are looking for a relaxing experience where they can be pampered and leave feeling rejuvenated and beautiful! When I started my business I only had one item, Style # 87P, a soft and beautiful feeling robe that clients could wear and not feel like they were wearing a garbage bag but that would stand up to the harsh chemicals in a salon including bleach and color. Our Peachskin fabric is like no other! We have it made especially for us and it is heavier than our competition offers. It is soft and silky and lasts for years of washing and wear. Since our humble beginnings we have added so many styles to keep up with our customers needs and requests. 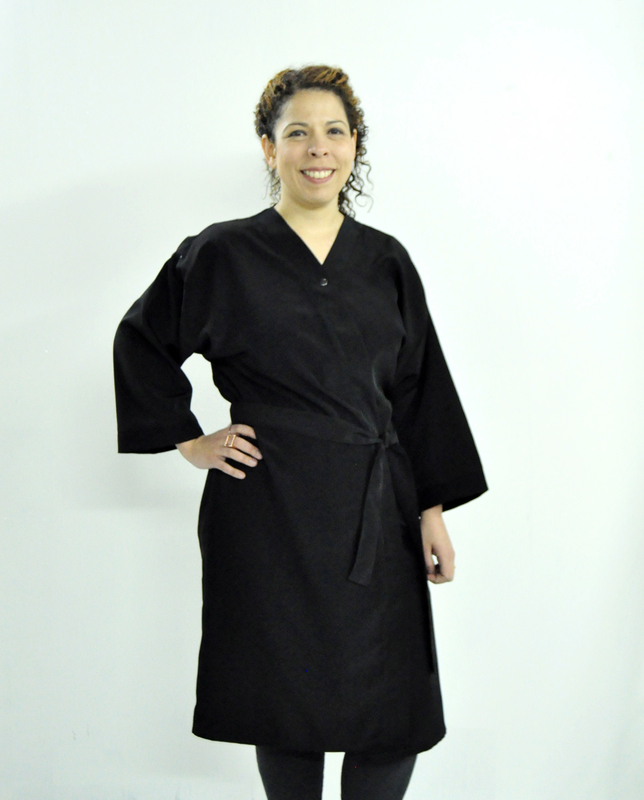 Did you know that we can design a robe just for your salon? One of my favorites is style # 7000. This robe has a great fit and is so elegant. Many of our high end salons love this style # 7000 for their clients. This style is also called the 5th Avenue robe. It is a longer robe with a long sleeve and a cuff for added elegance. We always encourage you to add your logo to help promote your brand!